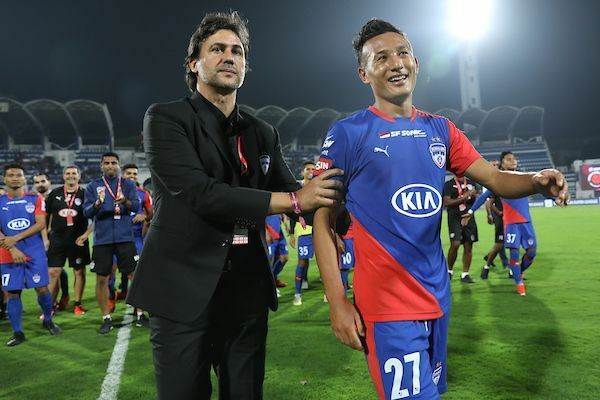 Indian Super League (ISL) leaders Bengaluru FC have announced that Chencho Gyeltshen has completed a loan move to I-League club NEROCA FC for the remainder of the season. The Bhutanese forward, popularly known as the Ronaldo of Bhutan, is a fan favourite at Bengaluru. His move was confirmed barely hours after he struck the winner for the Blues against NorthEast United at the Sree Kanteerava Stadium on Wednesday. That was, in fact, Chencho’s first goal at home and it was a crucial goal considering it helped Bengaluru reclaim the top spot on the table. Chencho’s other goal of the season also came against NorthEast United in the reverse fixture. That was fantastic overhead kick equaliser in injury time, which helped the Blues keep up their unbeaten run. However, Chencho found game-time hard to come by at Bengaluru. Although he has made nine appearances, most of them came off the bench. He has clocked only 359 minutes for BFC this season and heading to NEROCA provides Chencho a chance to improve his confidence and competitive experience. NEROCA is a team that is known to treat its players well. Given that they are placed fifth on the I-League table with 22 points in 14 games and trailing leaders Chennai City FC by eight points, Chencho’s addition would improve their attack drastically.